I am aware I need to create an entirely separate login and application for all 6 members of my family, however after completing the first one I don't see where I am presented the option to link family member applications in order to have the application cost limited based on the parts I've bolded above. 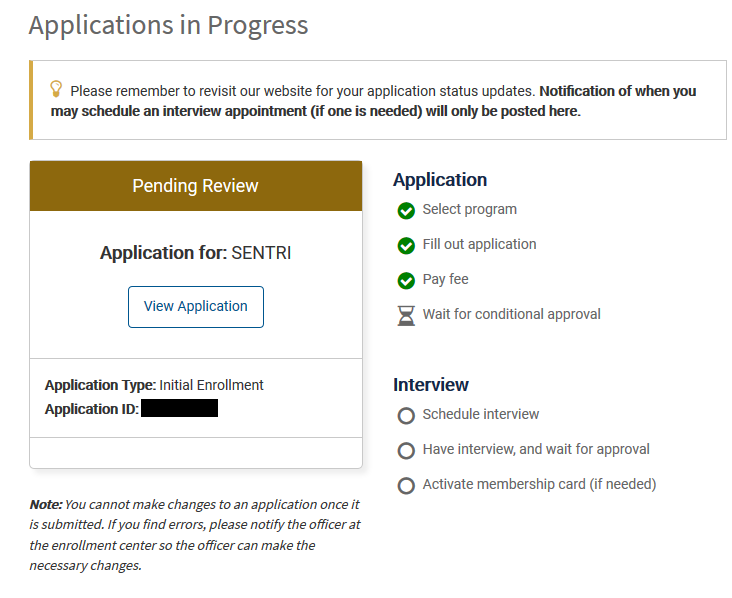 How do I ensure I only pay the maximum $50 application and $165.50 system cost for my family SENTRI application? I think I know the answer now. I wanted to complete all the applications before paying, so I filled them all in. I noticed that the payment information for my children said $0, whereas for myself and my wife it said $25 (application fee). I gather it gives the cost based on age not on whether you are linked to someone else's application. I hit Submit Application here and it tells me the application is in progress, same as it did for my wife and me, but without requiring CC information first. So it appears now I'll pay the $82.75 each for my wife and me, and $14.50 each for the two of us plus my two eldest children as they're over 14. Way better than $122.25 each for 6 of us. Not the answer you're looking for? Browse other questions tagged usa mexico fees-and-charges sentri or ask your own question. Is it possible to register someone elses vehicle with SENTRI? Can I use my passport card in the SENTRI lane on the Mexican border?